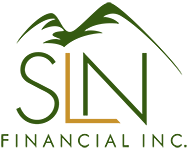 November 29, 2017 - Financial Checklist for Newly Widowed Spouses | SLN Financial, Inc. Losing a loved one and life partner is a devastating experience that no one can fully predict. Despite the emotional heaviness one must navigate, another pressing topic requires attention: finances. Knowing how to move forward in your financial life after such loss can feel overwhelming and confusing. In fact, according to one study, 23% of widows feel much less confident in their finances after a spouse’s death. With the right guidance, widows can move beyond the confusion and find clarity. Our brains work differently when under stress, meaning we can make emotionally distraught decisions that can lead to poor choices. A financial professional can serve as a voice of reason and provide educated perspectives to help guide awareness and action. In fact, 61% of widows say that working with financial professionals has the biggest influence on their decisions. You can make the entire process less overwhelming with an objective professional at your side to guide you during this difficult time. An important step is to contact all financial organizations with whom you and your spouse held shared accounts, from your bank to mortgage to investments. You will need to alert them of your loved one’s passing and retitle your accounts. You also need to have your spouse’s name removed from any other joint accounts. Addressing these matters will keep your finances accurate and updated, and remove any potential roadblocks. Each year, lots of people fail to claim money in the form of benefits, such as payments from pensions, life insurance, annuities, and more. In 2016 alone, people left at least $7.4 billion in life insurance benefits unclaimed. If your spouse listed you as a beneficiary in any accounts, you have some housekeeping to do in order to collect your benefits. And doing so could be a helpful financial boost, especially if you relied on your spouse’s income. To close financial gaps, identify which benefits are available to claim and take prompt action. Was your spouse already taking payments or still paying into a plan? Are you inheriting an IRA? The specific retirement accounts your spouse held will drive your next steps. For example, if you’re inheriting an IRA, your age can affect details like Required Minimum Distributions (RMDs). Working with a financial professional can help you identify the best strategies. With your spouse no longer involved in financial strategies, now is a good time to revisit your investments and identify if you need to realign anything. For example, you may receive benefit payments that you could redirect to other investment opportunities. Or, your spouse may have taken on more risk than you’re comfortable with. Take a look at how well your investments reflect your needs and future goals‐and help ensure your portfolio supports life"s next chapter. Picking up the pieces after losing a spouse is never easy. If you have recently widowed and seek clarity for the road ahead, we"re happy to help.